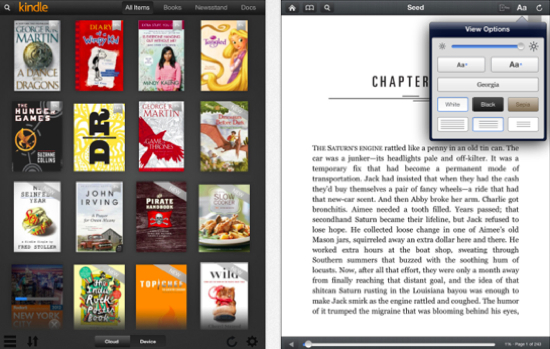 Using an iPhone or iPad to read books via Amazon’s Kindle App? If so, you will want to hold off on upgrading to the latest version of the app, which was released on Tuesday. That is, if you don’t want your content accidentally erased from your iOS device. Don’t worry, even if this does happen. the content is still safe in Amazon’s cloud. What it really means is that Kindle app on your iOS device will be reset and you will have to , basically, start over again from scratch by entering your mazon account information and then downloading your content again. Bummer. At least, if this does happen, all your content isn’t permanently gone. It’s more of a pain than a catastrophe. As is often the case with software, it needs to be updated. Apple’s iOS is no exception. So, with that in mind, we’ll let you know that Apple release an update to iOS today and it’s now available for download. Apple’s iOS 6.0.1 update contains, as is usually the case, the infamous “various bug fixes. It also contains a patch which fixes the iPhone 5’s inability to update itself over the air. That’s a bit embarassing to be sure. If you have an iPhone 5 you will need to download a patch update first, then iOS 6.0.1 update. Other iOS devices can just update over the air normally. Hoping to avoid issues when the new iPhone 5 arrives on Friday for those who pre-ordered it last week, Apple will release the next version of its mobile operating system for other iOS devices (the iPhone 5 comes with it already installed), dubbed iOS 6, today at 1 PM Eastern. Or, for those of you on the West Coast, that’s right about now. If you already have a device capable of using iOS 6 and are looking to update your OS, Apple makes it pretty simple. Just go to Settings > General> Software Update and it will ask you if you want to update. Of course, as you probably do, go ahead and say yes. The process will take some time, and may even stall a few times, but be patient as it will eventually work. You can also get the update by connecting your device to a Mac or Windows PC running iTunes 10.6.3 or later. iOS 6 is compatible with the following devices: iPhone 3GS, iPhone 4, iPhone 4S, iPod Touch 4th and 5th Generation, iPad 2 and the New iPad. We’ve been running iOS 6 for awhile now and so far, it’s a great update. If you decide to update, let us know how it goes. Hot on the virtual heels of Hulu Plus arriving for users of the Apple TV, Amazon today released an app for the iPad which allows users to stream content from its library of movie and TV titles. Curious timing, eh? The new app is capable of streaming Amazon Prime content for free (with a $79 a year Amazon Prime membership of course) as well as allowing users to download content for later offline viewing. Season Pass is also available for TV programs with episodes available the morning after the show airs on TV. • Start watching on your iPad, and resume watching right where you left off on a Kindle Fire, PS3, PC, Mac, or hundreds of models of connected TVs and Blu-ray players with Amazon Whispersync. The new app is available for the iPad over at the iTunes App Store. Even though some may have decided Google+ is a vast waseland with nothing to offer, I disagree. In fact, I often find more interesting discussion on G+ than I do on Facebook or Twitter. Not to say that my friends on Facebook or Twitter don’t have anything interesting to say, they do and often. It’s just that Google+ users tend to go more in depth on subjects and I’ve particularly liked the level of interaction you can have with people there. But up until now, one thing has been missing: Google+ on the iPad. Fortunately, that’s a problem no more as Google has today released an updated version of the G+ app for iOS which includes full iPad support. It’s pretty much the same as what you get on Android and looks great when combined with the iPad’s retina display. The Google+ update is available via the iTunes App Store now. Go get it. If you’re one of the millions of people who read comic books on your iPad or iPhone, this post should be of particular interest to you. That’s especially true in this case if you love Marvel Comics. Why? Well, today ComiXology and Marvel Entertainment have announced a multi-year deal where Marvel will distribute its digital comic single issue titles excessively through ComiXology. According to the report and interview with Marvel SVP and General Manager of Digital Media David Phillips, the deal was actually signed on May 1 but the announcement was delayed to coincide with the release of Marvel’s The Avengers. “This partnership will allow us to innovate and advance the digital storytelling and reading experience,” said ComiXology co-founder and CEO David David Steinberger. In addition to the Marvel deal, ComiXology also announced that over 65 million digital comics issues have been downloaded on all of its platforms, including mobile and desktop. That number is quite a jump from the 50 Million the company announced in January. Certainly there’s other options for reading comics on the iPad, but it would seem with this latest deal, and the one they already have with DC, ComiXology is definitely asserting its dominance in the digital comics space. As far as music services go, iTunes has pretty much been the dominant player for several years. However, Spotify has made great strides and has become a personal favorite of many members of The Flickcast staff. But as good as the service is, there’s been something lacking: an iPad app. Fortunately, the company is changing that today. That’s right, Spotify has announced that its iPad application is now available in Apple’s App Store. The free app allows premium Spotify subscribers to access the services huge library of music, stream tracks and playlists, and share songs. The new Spotify iPad app also features gapless playback, a crossfade function and AirPlay integration, allowing users to stream music wirelessly from the iPad to AirPlay-compatible devices. In other words, if your an ipad and Spotify user, this is just the thing you’ve been waiting for. On a side note, if you’re a Spotify user and want to listen to music at home I highly recomment pairing the service with some Sonos speakers. The Sonos Play 5 / Spotify combo is really hard to beat. Check out a video highlighting all the new features of Spotify for iPad, as well as the full press release, after the break. For screenwriters in Hollywood and elsewhere, the usual software tool for writing that million dollar screenplay is Final Draft. The software has been around for years, is used by most every TV and film production, and currently sits at version 8.0. Of course, now that devices like the iPad are so popular, many writers (myself included) are wishing for a version of Final Draft that will run on it. I’m pretty sure that piece of software is coming. The pent up demand is there, it’s just a matter of time before it’s satisfied. In the mantime, the makers of Final Draft have seen fit to release the Final Draft Reader application for the iPad. And while it isn’t a fully-featured screenplay writing app, what it does do, it does quite well. Well, this is a bit disappointing. Granted, it will probably only affect a small percentage of you out there, but it’s still kinda lame. According to reports, even if you have Apple’s shiny new iPad and want to engage in a little FaceTime with a, um, friend, you won’t be able to do it, even if you have super fast 4G LTE. It will only work over Wi-Fi. If you try, you will be prompted to connect to an available Wi-Fi network. Curiously, if you are using your iPad as a Wi-Fi hotspot, which you can with the Verizon version, FaceTime will work if you initiate a call using an supported iPhone or iPod. Apple has so far been moot on this issue but you can be sure people are going to be asking about it. After all, in many cases 4G LTE is as fast (or faster) than available Wi-Fi networks so the fact that FaceTime isn’t supported is difficult to understand. Again, this isn’t a critical point for most of you, we just found it interesting as it gives a bit of insight into how Apple deals with wireless carriers. Of course, it could be a decision on Apple’s part. . . but we kinda doubt it.